Gilbane’s federal team upgrades fire detection and suppression systems for five U.S. Air Force hangars. Gilbane modified fire alarm detection and fire suppression systems in four hangars and constructed completely new systems in a fifth hanger. The modifications required re-piping water lines to pressurize the high-expansion foam (HEF) bladder tank, adding/modifying tamper switches connected to the fire alarm panel, reprogramming fire alarm panels, replacing software programs to support hardware changes, relocating HEF generators to meet new time requirements, replacing floor-monitor nozzles and stands, rebuilding valves, replacing a 12-inch fire main lead-in, and replacing sprinklers. For the new fire protection systems in the fifth hangar, Gilbane installed an underground 12-inch main to the hangar, constructed a riser room, and provided complete new systems. These included a conventional wet-pipe system and an HEF system with a storage tank, ceiling-mounted HEF generators, all valves, piping, and controls, signage, fire alarm panels, and control panels. 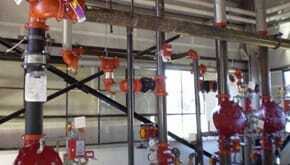 The systems included transmitting antennae and panels that relayed system status to the Base Fire Department. Gilbane met all cost, schedule, and quality requirements for this project without any safety incidents. The project was completed 3 months ahead of schedule with minimal items on the punch list. Work was also completed with minimal disruption to Base operations.